The Arizona Coyotes will return to play hockey in the Gila River Arena for the next two years. After that, all bets are off relative to the Coyotes’ future site and future of the building. This was the essential conclusion the city of Glendale and the Coyotes reached Thursday as part of an out-of-court settlement. The parties were scheduled to appear Friday, July 31 in Maricopa County Superior Court. That’s when the Coyotes were prepared to legally challenge the Glendale’s city council resolution, adopted on June 10, to break a 15-year, $225 million lease agreement. Here, the city was to pay IceArizona, the parent company of the Coyotes, $9 million annually for management of the Gila River Arena, and refused to pay on their quarterly obligation. Details of the settlement include the city to pay the Coyotes $6.45 million a year in management fees and for the Coyotes pick up additional revenue streams, such as parking. Also, the deal rips up an out-clause for the Coyotes that indicated the hockey team could leave after five years if losses exceeded $50 million or more by 2018. It’s likely resolution of this settlement is far from over. Though both parties really do not like each other, the economic stakes are far too high for either party to acquiesce. Phoenix mayor Greg Stanton entered the conversation when he recently proposed construction of a new multi-use arena for the Coyotes and NBA Suns in downtown Phoenix. Should the Coyotes eventually leave Gila River Arena, two major questions arise. One deals with the economic health and viability of the surrounding Westgate district, a mix-use complex of shops, restaurants, bars, hotels and home to both the arena and the University of Phoenix Stadium, residence of the NFL Cardinals. Plus, should the arena go dark, the citizens of Glendale would be stuck to honor the existing mortgage without a major tenet in the building. While the Coyotes said they were not willing to talk with the city on renegotiation, or even perhaps restructure the lease agreement, the Coyotes remained adamant to keep the agreement in its original state. On June 10, the city council voted to abrogate the existing lease agreement and refused to pay their quarterly amount to IceArizona. Superior Court judge Bergin then ordered the city to honor its financial obligation, and also raised the Coyotes bond from $250,000 to $1 million to cover any harm to the citizens of Glendale should the Coyotes prevail in court. Now, both parties had a change of heart, and details of the agreement reached Thursday will be made public during a special council meeting Friday morning beginning at 9 a.m. Pacific time. The core of the settlement indicates either party now can opt out of the agreement after two years. It’s no secret each party does not hold the other in high esteem, and should the Coyotes decide to vacate the Gila River Arena, they will likely stay in the Phoenix metro area. While discussion abounded for the past several years on possible relocation, the NHL would much rather receive a pot of gold from particular suitors rather than move an existing franchise. On Thursday, the NHL accepted expansion applications to put teams in Las Vegas and Quebec City. The application fee is $10 million, of which $2 is refundable. Should the league go ahead and award a franchise, an expansion fee starts at $500 million and likely will rise. Of equal economic concern, the NHL indicated, since the Coyotes financial quagmire commenced one-half decade ago, the league wants a team in the Phoenix television market. 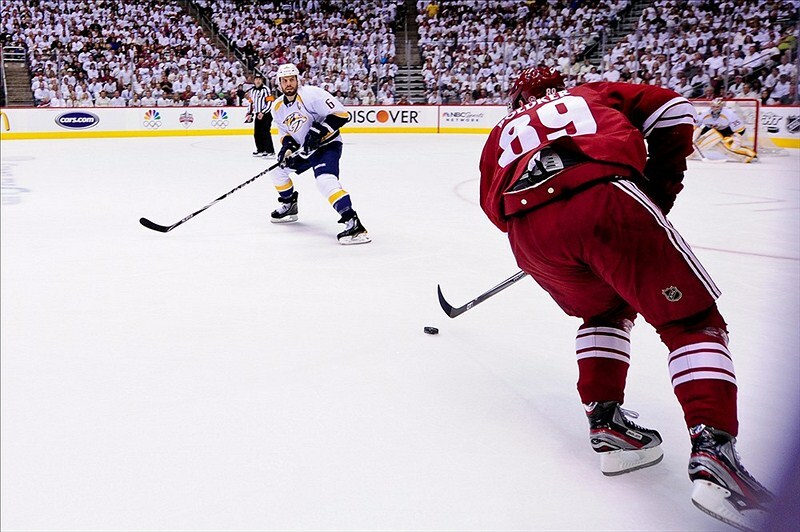 From the Coyotes vantage, the court battles and litigation has impacted their ability to do business. Corporate suites are not selling, Arizona is not attractive to free-agents or players involved in possible trades, and the Coyotes are having difficulty to finding financial entities to partner. Free agents reportedly are not interested in Phoenix until the legal mess is resolved. Evidence of this factor was the Coyotes ability to re-sign forward Mikkel Boedker for only one year. The Coyotes wanted to lock up Boedker in a multi-year deal, but the uncertainty of the Coyotes situation was a clear factor in Boedker signing for only the upcoming season. Though the Coyotes said they would not renegotiate the existing lease agreement, that’s exactly what they did. In the end, it’s unclear how and why they came to this position, and more will be known after the council meeting Friday morning.